<!DOCTYPE html PUBLIC "-//W3C//DTD XHTML 1.0 Transitional//EN" "http://www.w3.org/TR/xhtml1/DTD/xhtml1-transitional.dtd"> LabCraft-Sun Yat-sen Univ. 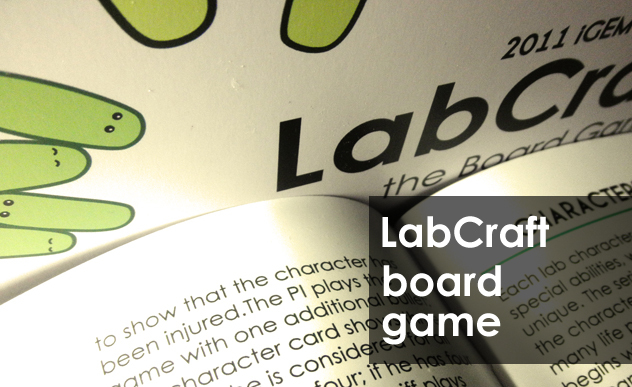 LabCraft is a shootout game that happens in a biological lab. In the lab, Everything is like haveing a war. The game itself focus between a group of Postdocs and the PI, who is their primary target. The PhDs incognito help the PI, but there is also a Master pursuing his own goal! In LabCraft each player plays one of these roles, and represents a famous lab character. Have fun and enjoy yourself with your friends, classmates, colleagues, even your teachers. 1 PI, 2 PhDs, 3 Postdocs, 1 Master. with colonies printed on the left side;. also called funtional cards, printed "LabCraft" on their back. And by the way, in the box we also offered several "colonies" cards printed with three, four or five colonies (circles that represented the blood/life you left). They must eliminate all the Postdocs and the Master, to protect the lab. They would like to eliminate the PI, but they have no scruples about eliminating each other to gain rewards! They help and protect the PI, and share his same goal, at all costs! He wants to be the new PI; his goal is to be the last character in play. Each lab character has some special abilities, which make him unique. The series of colonies near the character's picture show how many life points the character begins with, i.e. how many times he can be hit before being eliminated from play. Moreover, the conlonies indicate how many cards the player can hold in his hand at the end of his turn (hand size limit). The active player draws the top two cards from the draw pile. As soon as the draw pile is empty, shuffle the discard pile to create a new playing deck. Now the player may play cards to help himself or hurt the other players, trying to eliminate them. He is not forced to play cards during this phase. Any number of cards may be played. 2) No player can ever have two identical cards face up in front of him. When a card is played, just follow the instruction on it. Cards can be played only during your turn (with the exception of "Medium" and "Biofilm!" cards). Normally a card has an effect which is immediately resolved, and then the card is discarded. However, "Equipments" cards have long-lasting effects, and are kept on the table face up in front of you. The effect of these cards ("in play" cards) lasts until they are discarded or removed somehow, or a special event occurs . Once the second phase is over (you do not want to or cannot play any more cards), then you must discard from your hand any cards exceeding your hand-size limit. Remember that the hand size limit of a player, at the end of his turn, is equal to the number of life points he left. Then it is the next player's turn, in clockwise order. Please download the Guide Book of LabCraft (PDF) to learn more about our LabCraft. The box art (front cover) of the board game. The three basic game playing (or functional) cards.